THE IMPOSTER is a superb documentary by a British TV documentarian, Bart Layton, with a good pedigree in true crime stories. It tells the true story of a young man in Spain who adopted the identity of an American missing person to stay one step ahead of Spanish social services and keep his place in a childrens' home. However, this appropriation set of a chain of events that led him to the USA and the family he supposedly belonged to. The first shock of the film is that the family fell for the imposter, despite the differing eye colour, the bleached blonde hair and the European accent. The second shock is that this credulity might have stemmed not from the desperate desire to believe that a loved one is still alive, but in order to have an alibi to the alleged murder of the real missing boy years before. The third shock, for me at least, is that despite the fact that Interpol had a long line of similar con tricks committed by the imposter, his crime was treated as a criminal matter rather than as a psychological disorder. Bart Layton crafts a film that is blessed by full access to the imposter and to the real missing child's sister, brother-in-law and mother. We therefore see and understand his motivations. He speaks with utter conviction and disarmingly credible even when we know he is lying. So when he accuses the family of murdering the real child - the only reason they could be willingly taken in by him - how far should be believe a man who has a scary grip on reality and others' feelings? As for the family, they realise that to protest their innocence, even though there is zero evidence against them, is to fight a losing battle against prurient gossip. The documentary is scrupulously fair. It allows the imposter, Frederic Bourdin, to display himself as intelligent, perceptive but also dangerously delusional at best. It allows the mother of the boy to show herself as distraught but also highlights the drug abuse and petty crime in the family. Who can we believe? This is left open. But the telling of the tale is suspenseful and the vehicle of the telling, polished. THE IMPOSTER played Sundance 2012. It opened in New York in July and is currently on release in the UK and Ireland. It opens in Canada on October 12th, in Denmark on October 18th, in Sweden on October 22nd, in Russia on November 22nd, in New Zealand on January 10th 2013, in Australia and the Netherlands on February 28th, and in France on April 17th. 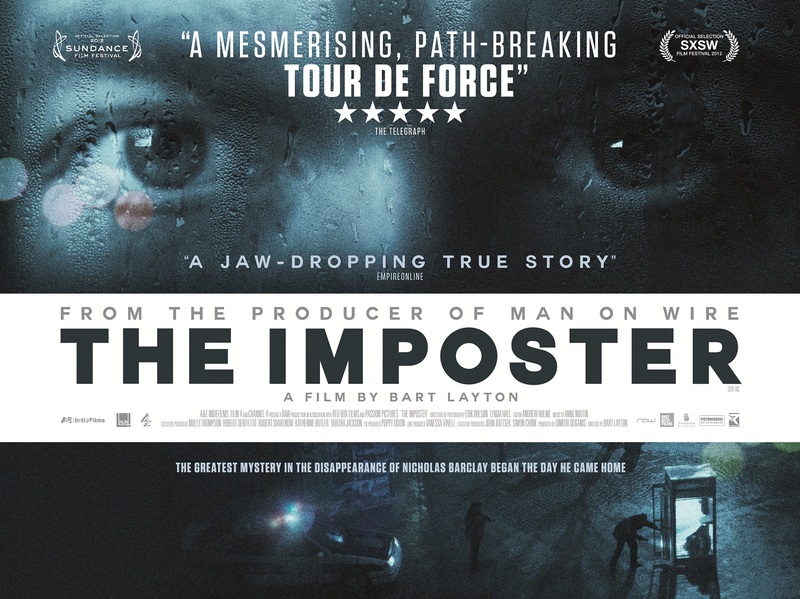 THE IMPOSTER was improbably rated R in the USA and has a running time of 99 minutes.